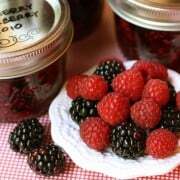 If you could have only seen inside our fridge this past week. It was stuffed with all kinds of delicious football-watchin’ food. I’ve been on some kind of appetizer making crazy train. Each supper meal has brought something new and fun to the table as our main course, accompanied by a simple side of steamed or roasted vegetables. Blake has been sure to tell me just how much he’s been enjoying each meal. Hoping for more football food the next evening, perhaps? 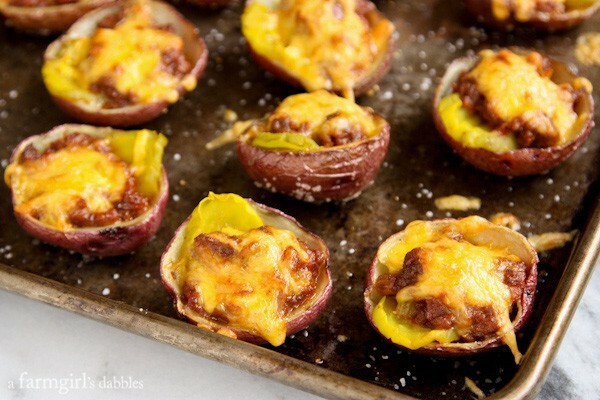 These Sloppy Joe Baked Potato Skins with Smoked Cheddar were a huge hit. I had never made baked potato skins before, and now kick myself for not trying them sooner. The thin and crispy, salt-sprinkled skins are completely addictive! The first time I remember thinking I should try making a baked potato skins appetizer was when I saw this jalapeno popper version from Kristin (yummo!). But it wasn’t until I was reading Amy Thielen’s cookbook, The New Midwestern Table, that I decided to finally give it a go. If you don’t already own Amy’s book, I highly recommend it. Her writing style, beautiful recipes rooted in the Midwest (some familiar, some not), and richly told stories from her life in rural northern Minnesota are captivating. After finally meeting Amy in person a few months ago, her smiling voice resonated with even more meaning as I read each and every recipe’s story. You already know how much I love red potatoes, so it should come as no surprise that they were my choice in potato skins. 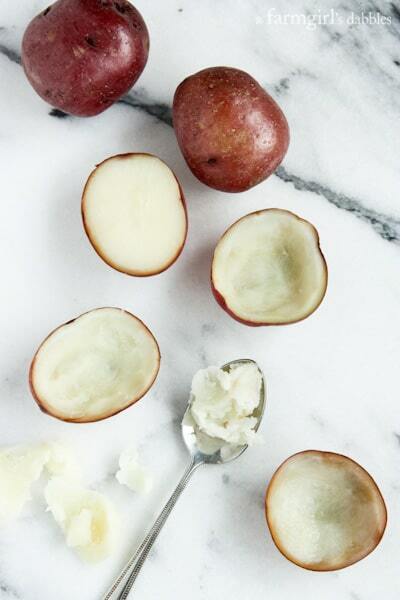 Besides having a thin skin, I love that red potatoes can always be found in a small “baby” size, perfect for these appetizers. This past week’s extremely cold temps had all of us craving, or should I say needing, warm comfort food. And I couldn’t get sloppy Joes off my mind. While I was throwing everything into the slow cooker for an evening meal of sloppy Joes, Amy’s book stared at me from the kitchen counter. My gears started turning, and pretty soon I was planning the next evening’s meal of baked potato skins, using sloppy Joes leftovers. Blake and I popped these babies into our mouths unapologetically, savoring the crispy, salty skins and gooey, smoked cheddar over little mounds of our favorite sloppy Joes recipe. With a dill pickle chip wedged into each little shell, in true sloppy Joe fashion, this recipe is destined to be made every time our slow cook churns out another fabulous meal of sloppy Joes. Tip: Make the Sloppy Joes a day or two beforehand, to first enjoy a meal or two from. And simply reserve 1-1/2 cups for this recipe, to make these potato skins later. 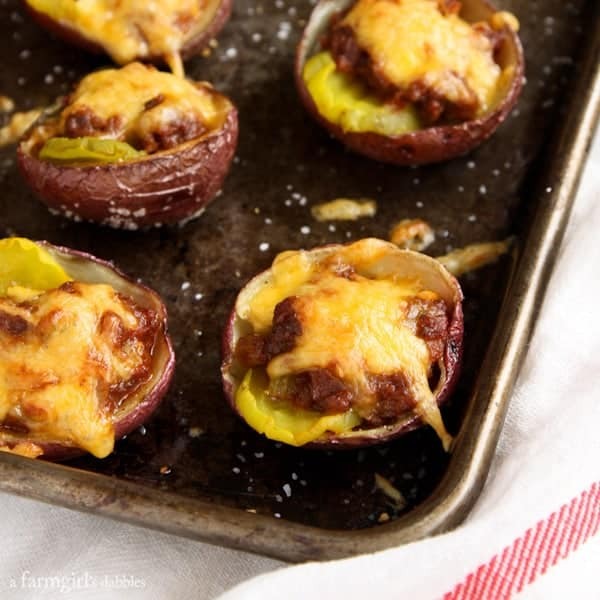 You could even freeze the sloppy Joes mixture to make the potato skins weeks later. 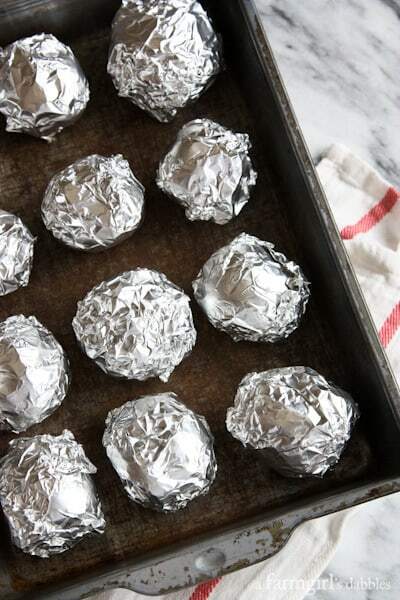 Wrap each potato in a layer of aluminum foil and place the potatoes in a 9″ x 13″ pan. Bake for 40 to 50 minutes, or until potatoes are tender when squeezed through the foil. Unwrap and let sit until cool enough to handle. Raise oven temperature to 400°. Cut potatoes in half lengthwise. With a large spoon, scoop out the potato flesh, leaving a 1/4″-thick shell. Brush the shells with oil, inside and out. Sprinkle the insides with a bit of salt and pepper, and the outsides with a bit of salt. Don’t skip sprinkling the outsides – this adds great flavor and texture to the final potato skins. Place potato skins on a large baking pan and bake until the edges are nicely browned, about 25 minutes. Place a pickle slice on the inside edge of each hollowed-out potato skin. Divide the sloppy joes mixture among the potato skins, letting the pickles peek out. Then top with the cheddar, dividing it evenly among all the potato skins. Bake until the cheese has melted and the edges of the potato skins are browned and crisp, about 20 minutes or so. Then set the pan under the broiler for a minute or two to brown the cheese a bit. Serve immediately. Adapted from the “Potato Skins with Smoked Cheddar and Bacon” recipe from The New Midwestern Table by Amy Thielen. Wow, theses look so awesome! Going to try these out this weekend! I missed that you got to meet Amy! She seems like such a sweet, down-to-earth person. Long live football food! Yes! I met her out in NY at the Longhouse Food Revival this past fall. She did a little cooking demo and hung out for a day – extremely down to earth. This is my idea of the PERFECT appetizer! Wow, my family would go crazy for these!! These look and sound dee-lish! Oh Brenda, these look amazing! 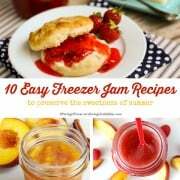 Want to give them a try soon. I am not surprised this was a HUGE hit. I am a big fan of smoked cheese too. My family would clean the serving pan of this. These are so fun Brenda!! My husband is sloppy joe obsessed, he would love these. I love potato skins!!! 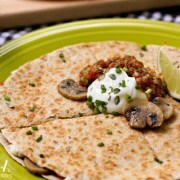 And I love the idea of adding sloppy joe mix to them. 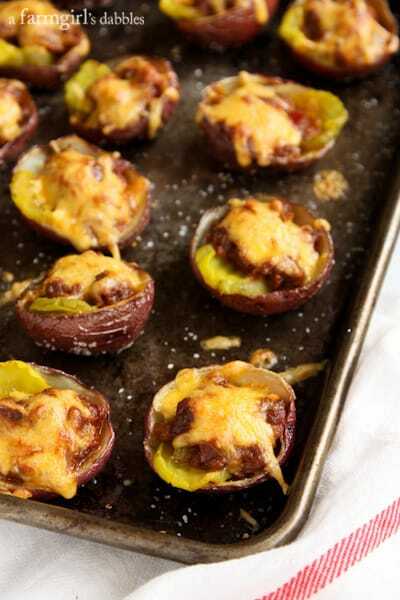 These look amazing and my husband and I love appetizers on game day instead of a big meal. These will definitely be on the menu for the Superbowl game. Go Seahawks!! !